I can't believe that Christmas is a week away! Wasn't Halloween yesterday? :) well I have started this coming week being out of town as I mentioned yesterday. It's really not a "fun" trip; rather a necessity, but I will squeeze in a little bit of fun with a friend nonetheless! I wanted to share with you a card made for one of my boys teachers. I love this image as it is fun and cute! Penguins just make for adorable images I guess! This is from The Cats Pajamas. I colored in the image with my Copics and added some Our Craft Lounge Sparkly Fluff to the stockings and hat. Dp is Cosmo Cricket and I used my MS border punch for the middle panel. I finished the card with some bling and red cord and popped up the image in the centre. Thats about it for me today! Thanks for taking a peek and stopping by! I will be quiet the next few days until I get back, but will have more to post then! Have a great weekend! It has been a hectic week for me trying to get everything done. I have to leave out of town tomorrow until Tuesday, so I have been busy getting everything organized for the hubby to ensure the kids bring presents, goodies, etc. to school Monday and Tuesday. I know he is tickled to have to be left attending the school parties and being the class mom! ; ) He really is a trooper!! 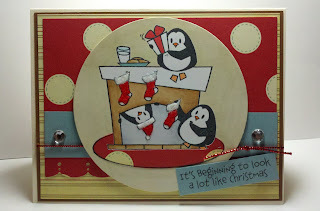 Today, I wanted to share with you a card made with an image from Our Craft Lounge. These guys are just so cute!! Our Craft Lounge is having a sale, so if you haven't already, check it out!! There are some good deals!! Thanks so much for stopping by and taking a peek!! Have a great Friday!! For this sign, I used an 11x14 canvas, some acrylic paints, acrylic paint markers, some crystal embellishments, and finished it off with some glitter glaze for the sparkle. 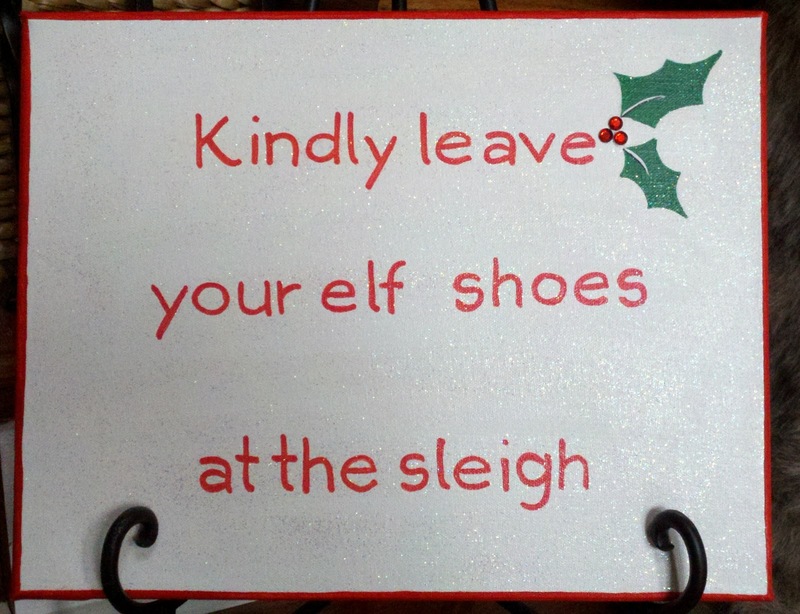 You will see in the next sign my terrible handwriting, so for this one, I used a template that I cut out using a Cricut. That allowed for much better looking letters. I really wanted to leave it very clean and Christmas like, so just the basic Christmas colors. 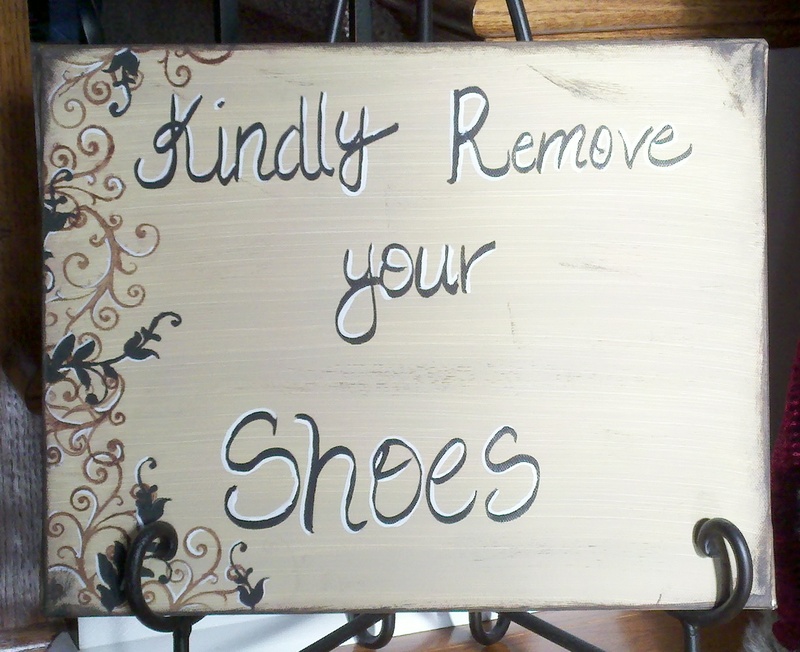 This sign I wanted it to look a little shabby chic in the colors to match the entryway of my home. As for both signs, I place them in a large easel which I bought at Hobby Lobby. A very simple project that can add some personality to your decor even if it is not to remove your shoes!! Thanks for peeking and hope your holiday activites are keeping you on your toes! I am happy to say that I am done with shopping, cards, and decorating!! Woot! I now hope to get more inky!! Have a great day! Anyway, I wanted to share a graduation card I made for a friend. Very simply made, (the ones I love!) 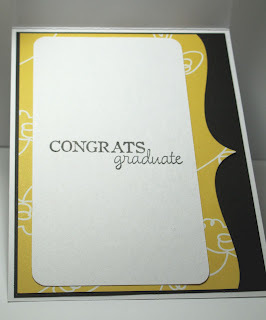 And used with an inexpensive Studio G stamp. Cs is American Craft and the die is from Spellbinders. I finished it off with ribbin, and the inside edge is from The Cats Pajamas. Thanks for peeking! Have a great day!